With the introduction of the MNOVC website in 2011, this electronic vehicle has proven to be an effective way to providing the Veteran Community with an information source and communication network. Meeting of our mandate of representing and promoting MNO Veterans was foremost in our planning and was fully endorsed by the council. The ratified MNO Veterans’ charter was implemented along with the MNOVC community code/bylaws. This was crucial as it addressed the outstanding definition of the term “veteran” and how it applied to MNO Veterans. The first Métis Veterans’ Wreath was introduced in November 2011 and will be placed again this year. Our very first MNOVC meeting was held in Oshawa in July. The Veteran registration process was placed into full swing. Although met with some initial resistance, this has proven to be very effective in the Veteran verification process and protecting our Veterans. Approximately 50% of the old list chose to not register. This unfortunately diminished our enrollment to about 20. The 2012 elections went well with the acclamation of a president, chair, Treasurer and Sgt-At Arms. The positions of Senator, Women’s Representative and Secretary were not filled at the time. Prior to the 2012 AGA, Veteran George Kelly was appointed to the position of Senator for the Veterans in July. MNOVC first business cards were generated for the council which were utilized to interface with our clients and proponents. The MNOVC introduced the first Louis Riel certificate. This Certificate compliments the Louis Riel medal and is a Métis document for the future. It is fully traceable through the MNOVC database and The Métis Nation of Ontario registry system. We are encouraging all our Veterans to send in their documentation to the MNOVC for verification. On an ongoing basis, more will be issued as time goes by which will aid us in identifying and registering other Métis Veterans in their community. The MNOVC had representation during the unveiling of the 1812 banner. This took place at the Fort York Armories in Toronto on May 22, 2012. In attendance were His Royal Highness Prince Charles and the Duchess of York, Prime Minister Harper, Governor General Johnston and many other dignitaries, civilian and military. This was a great event and again helped put the Métis in historical perspective as having contributed in the war of 1812 and to the formation of Canada, this great country. Three of our Métis Veterans attended and proudly wore the Métis sash. In the fall, the MNOVC again had representation along with MNO President Gary Lipinski at Rideau Hall in Ottawa during the 1812 banner presentation by the Governor General to the Métis Nation of Ontario. Throughout Ontario, MNO Veterans participated in Remembrance Day Ceremonies. MNOVC delegates attended the Change-of-Command ceremonies held at CFB Borden and presented the new C.O. with a sash. The 2012 AGA held in S.S. Marie was the first AGA for the new council. At the 2012 AGA, the MNOVC Veterans were again, front and center. The Veterans were part of the colour party that carried the Nation’s flags. Formally dressed with medals, it was nice to see our Veterans stand proud of who they are, not only as Métis, but also as Veterans. We had about sixteen Veterans attend last year’s AGA. We would like to thank all those that attended and contributed to its great success. Several Veterans were awarded the Queen’s Diamond Jubilee medal at the MNO AGA and by the old NAVA organization. The first proposal to council regarding a Veterans book was communicated on July 31, 2012. Some reluctance to the size of the project was encountered but, all agree to pursue the venture. Our hearts were saddened by the passing of Veteran Senator Earl Ralph Scofield (Boots) from the MNO Windsor Essex Métis Council. His passing occurred just before Remembrance Day. MNOVC provided a wreath. Our hearts were further saddened by the passing of Veterans’ Council Senator George Kelly in early March 2013 in Florida. He was from the MNO Ottawa Métis Council and had been with us for less than a year. The MNOVC had representation at the funeral service in Ottawa. The council appointed Dr. Alis Kennedy as their new senator. The MNO AGA 2013 took place in Ottawa. Alex Boucher, then 100 years and 8 Months old MNO Veteran attended with his daughter. This was special since he is the oldest of all the MNO Veterans. A special sash stating, “100 Year Old Veteran” was secured and presented to Alexander Boucher at the MNOVC AGM. His Louis Riel medal and certificate was presented to him at the assembly. A tour of the War museum, National Cenotaph and the Aboriginal monument was organized by the MNO and Jane Brennan (MNO Registrar) acted as the official tour guide. The Veterans’ tour was complimented by Métis youths. A new batch of Louis Riel medal had to be ordered to present to new verified veterans. Along with the medals, a small roll of medal ribbon was purchased for the mounting of the medals. The MNOVC was successful in securing from the MNO a beautiful banner which is proudly displayed at many MNOVC events. We thank the MNO staff for designing the banner and helping to promote our veterans. More MNO Veterans started submitting articles for the Voyageur magazine. We encourage the Veteran Community to participate in the promotion of our Veterans. In the spring of this year, the MNOVC launched the Veterans’ book project. The monumental task was met with great responses from the veterans’ community and MNO citizens alike. A sub-committee was established with the responsibility of gathering all the bios, stories and anecdotes. This process is ongoing. The MNOVC was successful in securing permission from the Royal Canadian Legion in the use of their registered logo on the MNOVC website. This logo can be found complimenting each Métis Veteran on the list of our comrades that have passed away. We shall remember them. The MNO Veterans’ Council put out its first draft of our Standard Operating Procedures. This only affects how the council proceeds with regards to the issuing of medals, certificates, flags, protocols, and the everyday administering of council business. The SOP’s also include procedures for appointments and record keeping. We had our first display booth at the Oshawa event. Unfortunately, it was before we acquired the MNOVC banner from the MNO. The MNOVC was further saddened with the passing of Veteran Peter Grisdale from Moon River Métis Council. The MNOVC provided a wreath and had representation at the Celebration of life held in Woods Bay. The council continued to receive the stories, bios and anecdotes for the Veterans’ book. This will continue into the first part of the 2015 year. A “new” Louis Riel certificate was generated by MNO staff along with the layout for the “new” MNOVC business cards. The new certificate replaces the old certificate and continues to provide complete traceability. It was well received by the veteran’s community. In conjunction with the Communications Branch of the MNO, an appreciation certificate was created so that the MNOVC could acknowledge individuals and organizations for their contributions to the promotion and support of the MNO Veterans. A meeting with the Royal Canadian Legion Dominion Command was held in Ottawa in April. The MNOVC representatives presented the RCL with an appreciation certificate and Métis sash in recognition for their involvement and help. A meeting was held with MNO staff in Ottawa concerning the Veterans’ book content and layout. Samples from Nancy Hamer-Strahl were provided. Throughout the year, Veterans from around the province continue to send articles to the MNOVC which were published in the Voyageur. Many thanks go out to all that contributed. Thanks to all those that were able to attend the Remembrance Day Ceremonies around the province. Once gain the council has had to order more Louis Riel medals. This is a good sign which indicates that the enrollment is increasing. We had to also secure medal ribbon for the mountings. The MNOVC was successful in securing private funding for these purchases of medals and ribbon. To date, we assemble our own swing mount medals which are very time consuming. The council appointed Lisa Tessier as the Women’s Representative for the council. We still have one vacant position of Sergeant-at-Arms, as the original position became vacant by the previous incumbent transferring to the position of the MNOVC Secretary. Hopefully it will be filled soon. Much work went into the final submission to the MNO regarding the veterans’ book. The council appointed Rob Baskey as the council Sgt-At-Arms and for the first time, all positions on Council are filled. In the spring, the council launched the Vimy Ridge Pilgrimage project with the intent to have Veterans and Youth go to Vimy Ridge in 2017. Sub-committees were set up to tackle fund raising, logistics, foreign Affairs and procurement. Advertising in the Voyageur, MNO and MNOVC websites, gatherings was implemented. A go Fund Me page was set up to help raise funds. The advertising was circulated by several organizations such as the NWMO. The MNOVC was successful in securing about $7000.00 for the publishing of the Veterans’ book (A first in the province of Ontario). 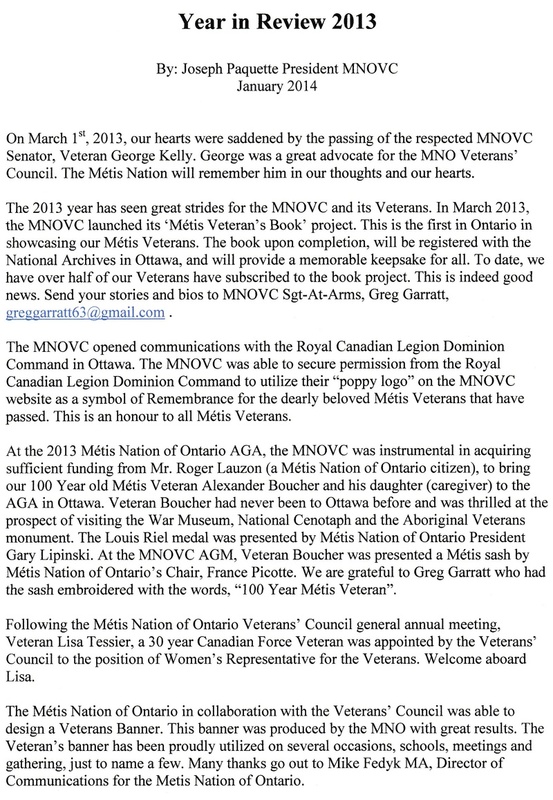 The veterans’ book was launched with great success at the MNO AGA 2015 held in Midland. 100 copies were printed for the AGA and were sold out by supper time on Saturday. Copies were sent to Library and Archives Canada in Ottawa. Copies of the book with an appreciation certificate were presented to NWMO, Hydro One, OPG and Techno-Metal Post for their contributions. The MNOVC had their first booth at the AGA held in Midland. The auction went well and helped raise funds not only for the council but also Vimy Ridge Project. We even had a couple of pipers come in and play for the booth. That raised a few eyebrows and increased sales. The MNOVC was successful in establishing a good relationship with the Belleville Police Service who was involved in the Louis Riel medal and certificate presentations at the Trenton Museum. The MNOVC held its first Youth/Veteran Knowledge/History Exchange in Midland. It was a great success. During the summer, the MNOVC had representation in the Pan Am Relay and the 400th Anniversary of Champlain. The UNDOF monument located in CFB Kingston was a tribute to a close friend and was originally designed and built by Roger Ladouceur C.D., a proud Métis Veteran who is registered with the MNOVC. Due to not meeting the number criteria from the Tours company, the MNOVC had to change the location from Vimy Ridge, France, to Vimy Commemorations in Ottawa, our nation’s capital. Plans are in progress to secure transportation, accommodations and such in order to secure our place in the Commemorations. The fund-raising is ongoing and will be utilized to make the Ottawa Commemorations a great event. Plan are in process. Plans are currently being devised to honour our 103 year old Veteran, Alexander Boucher. Every year since 2012, the MNOVC has had representation at Louis Riel Day in Toronto and other locations, Remembrance Day, social events, and Métis gatherings throughout the province, not to mention every MNO AGA by providing a colour party. During the pass four years, several Veterans have been awarded Medals and Awards such as the Order of Ontario and the National Order of the Legion of Honour, Knight Degree. This was quite the achievement. Raising the bar has not been an easy task. The MNOVC has taken every opportunity within our grasp to promote, advocate and showcase our Veterans that served this great country Canada and thanks all those, including Veterans that help us service YOU……our Veterans. The nominal roll started in 2012 with 22 verified Veterans and now sits at 69 verified Veterans for 2016. This is an increase of over 209%. I would like to thank the MNO Veterans’ Council for believing in making a positive difference, working together through many challenges/obstacles and raising the bar. It sure has been an HONOUR. An exciting four years…indeed. What an exciting year this has been. In April 2014, the MNO Veterans’ Council appointed Veteran Lisa Tessier C.D., as their Women’s Representative. Lisa brings on board over thirty years of military service. What a great addition to the council. We now have over 125 years of accumulated military service within the MNO Veterans’ Council that serves you, our Veterans. From April 2014 to March 2015, the MNO Veterans’ Council has brought on board many new veterans and has issued approximately 10 Louis Riel medals with accompanying certificates. This now brings our Veteran membership to over 50 verified MNO Veterans. There is another 10 applications due early 2015. This is quite the achievement and we thank all those responsible for the recruitment of our cherished Veterans. The MNO Veterans’ Council was successful in securing a small amount of private funding that provided capacity to purchase Louis Riel medals, ribbon for the medals and card stock for certificates. The MNOVC participated in several events throughout the 2014/2015 year including November 11th throughout the province. MNO Veteran Rene Leonard C.D., and executive MNO Senator Reta Gordon laid a wreath at the Aboriginal Veterans’ Monument in Ottawa on behalf of the MNO Veterans. Throughout the year, the MNO Veterans’ Council has had representation at several events including Minaake Awards, Life Celebrations, Veterans Affairs, Order of Ontario investiture, Louis Riel Day (Toronto), Digital Storytelling with TYRMC and at local MNO Council events. The MNO Veterans’ Council also presented two appreciation certificates to MNO citizens that have shown support for our veterans. Three more certificates are pending for 2015. The Veterans’ Book project is now at the layout stage with anticipated publishing in early July 2015. The official book launch will be scheduled for the MNO AGA 2015. And lastly, but not forgetting, our MNO Veteran Alex Boucher celebrated his 102nd birthday in January 2015. Happy Birthday Alex…………. First, we wish every one a Happy 2013 Year. May it be filled with happiness, prosperity and good, health! 2012 sure has been an exciting year for the Métis Nation of Ontario Veterans Council. Starting with the spring elections of 2012, the new Council has moved forward on many fronts. The newly elected council has brought forth a responsible and accountable team of Veterans that are dedicated to you, our Veterans. With our ratified Charter and Community Code (bylaws), we are well equipped to affect positive change and move into the future with certainty. The past year has brought Veterans closer together across the province. MNOVC Veterans participated in the official unveiling of the 1812 commemorative banner and medal. This took place at the Fort York Armouries in Toronto on May 22, 2012. In attendance were His Royal Highness Prince Charles and the Duchess of York, Prime Minister Harper, Governor General Johnston and many other dignitaries, civilian and military. This was a great event and again helped put the Métis in historical perspective as having contributed in the war of 1812 and to the formation of Canada, this great country. Three of our Veterans attended. Our very first MNOVC meeting was held in Oshawa in July. Representatives from the Métis Nation of Ontario also attended. Much was achieved and set the tempo for the rest of the year. At the 2012 AGA, the MNOVC Veterans were again, front and center. The Veterans were part of the colour party that carried the Nation’s flags. Formally dressed with medals, it was nice to see our Veterans stand proud of who they are, not only as Métis, but also as Veterans. We had about sixteen Veterans attend last year’s AGA. We would like to thank all those that attended and contributed to its great success. Following the MNOVC AGM at the 2012 AGA, the Council held a meeting in Midland on October 13, 2012. Our next meeting is scheduled for late February 2013 in Trenton. Details will follow. 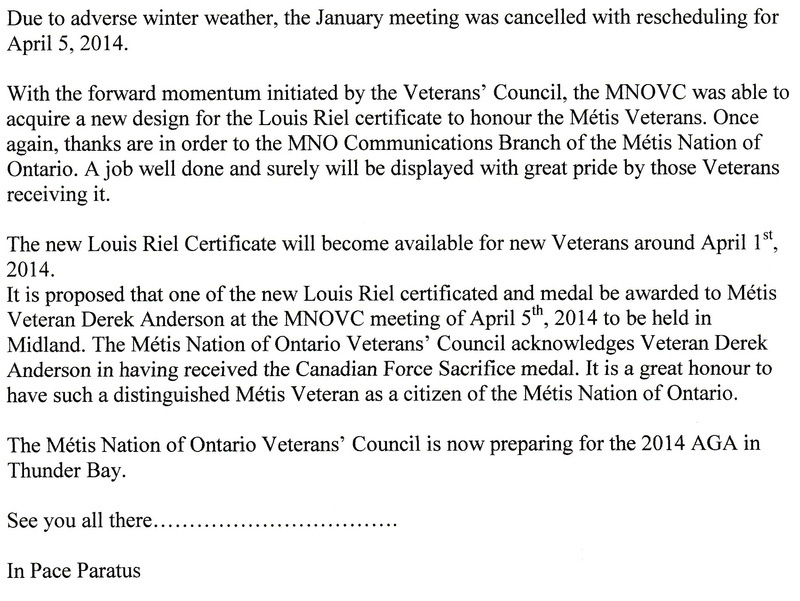 Note that all MNOVC meetings are open to all MNO Veterans. On October 25, 2012, MNO President Gary Lipinski and MNOVC President Joseph Paquette attended the formal presentation of the 1812 Commemorative Banner and medal at Rideau Hall in Ottawa. Along with Saskatchewan, Manitoba and Quebec, the Métis Nation of Ontario was acknowledged for their contributions in the war of 1812 and taking our place in the Canadian fabric as having participated in the forming of this great country, Canada. The banner and medal will be on display at the Ottawa MNO office for all to see. This is truly a historic day for the Métis Nation of Ontario. In November, just prior to Nov. 11th, one of our beloved Veterans, Veteran/Senator Earl Scofield, “Boots”, who had recently been awarded the Queen’s Diamond Jubilee medal, passed away in Windsor. The Council responded by sending a floral wreath. This did not replace the loss and love we all felt in our hearts. We will surely miss you “Boots”. YES, you are a Veteran! We are starting to get inquiries from younger Veterans who served in Afghanistan and other deployments throughout the world. Many feel they are not Veterans. We need to encourage them to take their place as Métis Veterans and join us in our march forward in our future. We thank them for their service to this great country, Canada, and welcome them home. Come join our proud Métis Veteran Family. In conclusion, the MNOVC will continue to advocate for the MNO Veterans. The council is also looking into acquiring funds from private funding sources to better serve the Veteranship. We have slowly started to plan for the next AGA in Ottawa 2013. We are looking forward to a great year 2013 and wish all of you and your families our very best wishes.